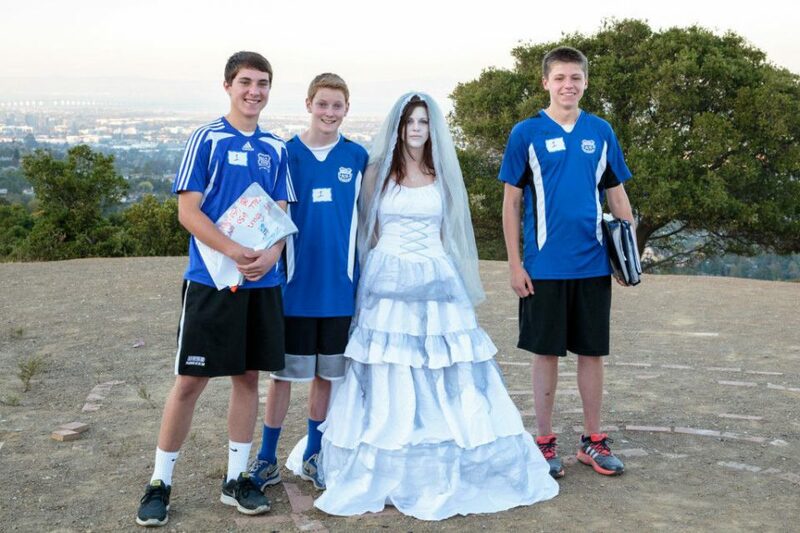 At one minute past 6:00 pm on Saturday, October 19th, at the top of Eaton Park, Zach Bene, Nathan Godwin and Ryan Jeffries, unraveled the mystery of El Diablo and were given the keys to the treasure chest by the ghost of Mary Hull. Saturday’s event capped off the 8th Annual event for San Carlos Treasure Hunters. Over 350 people participated and volunteered in this year’s event. We will look forward to seeing everyone again next year. Dear Bob, I never got the chance to thank you and David in person for the fantastic Treasure Hunt this year. It was hard but it was fun! My kids–Team Fire-Breathing Rubber Duckies–learned a lot about their hometown and I enjoyed spending time with them in Eaton Park, even if I crawled under more bridges than I care to remember. I remember last year you requested donations to support CLC’s principal. Since you didn’t specify anything this year, we will make a contribution to SCEF in honor of SCTH. Thank you so much. It was a day to remember! This event is such a wonderful way for children and﻿ their parents to get to know their community of San Carlos and have a fun day together. Keep it up Bob and Dr. Young. It gets better every year!